At some point in our lives, most of us have tried tequila. Whether you go out with friends and do tequila shots or drink margaritas, you tried it once and absolutely hated it, or you like to use it as an ingredient when cooking Mexican food, you might be surprised at how little you know about this popular Mexican spirit. 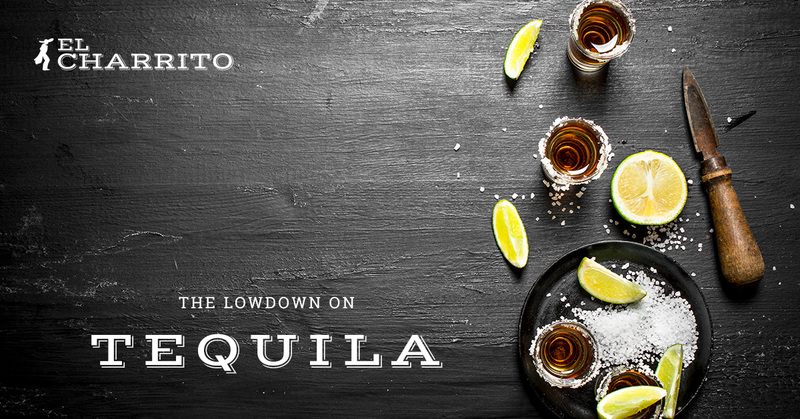 Tequila is a huge part of Mexican food and culture, so even though we don’t serve alcohol at El Charrito in Monterey, we decided to put together a quick and dirty lowdown of tequila, from its origins and different classifications to how is consumed. Every kind of genuine tequila on the market comes from blue agave, a giant plant resembling a monstrous succulent. It is believed that while ancient Aztecs first used the sap of agave plants to create a fermented drink called pulque, true tequila was not distilled from agave until the Spaniards invaded in the 1400s and produced mezcal, a Mexican spirit that is to tequila what whiskey is to bourbon and scotch. Almost identical to mezcal, with the only difference being that it is distilled from blue agave only, tequila production began in early-1600s Jalisco and evolved into a booming industry in Mexico when the Cuervo and Sauza families started building their businesses in the 1700-1800s. Then in 1936, when the United States Prohibition ended and Americans were allowed to legally indulge in the beloved Mexican spirit, the margarita was born in Tijuana and quickly became an American favorite. And, well, the rest is history. Knowing the different classifications of tequila comes in handy when ordering shots, margaritas or any other kind of tequila cocktail, as it can save you from buying overpriced drinks that are made with low-grade tequila that is not made with 100 percent blue agave. The key to ordering a great cocktail is knowing the difference between silver, gold, reposado, añejo and extra añejo tequila. Silver or blanco tequila is distilled from 100 percent agave and is known as the purest form of tequila because it is only aged up to four weeks, if at all. Due to its delicious pure agave flavor, silver tequila is also regarded as the best kind of tequila for cocktails and is typically used in margaritas. Unlike silver tequila, gold tequila gets its bronze color from the caramel coloring that is added to tequila before the fermentation process, reducing it to only 51 percent agave. Don’t be fooled by marketing techniques that suggest gold tequilas are better due to their dark color, because in reality, they are unaged, impure and diluted with artificial coloring and sugar. The Spanish word “reposado” translates to “rested” in English, meaning that reposado tequila is the first classification of aged 100 percent agave silver tequila, which matures in oak barrels for two to 11 months. Due to the natural golden color and robust flavor it develops during the aging process, reposado tequila is regarded as a higher-grade tequila and is sipped or used in cocktails rather than shot. “Añejo” or “vintage” tequila is classified by its lengthy aging process in oak barrels, which spans anywhere from one to three years. This extra long aging period deepens the color and flavor of añejo tequila to a smooth, amber-colored 100 percent agave tequila. The finest kind of tequila, extra añejo, goes through the longest aging process in oak barrels, which exceeds three years and legally must be diluted with water to reduce the alcohol content before consumption. Like reposado tequila, añejo and extra añejo tequilas are more expensive and are meant to be sipped so the consumer can enjoy their smooth and complex flavors.